The malls are decked with wreaths and Christmas trees, Christmas music has snuck into my Itunes account, and I saw my first Christmas lights yesterday. I know it's still November and not yet even Thanksgiving, but Christmas will be here soon! 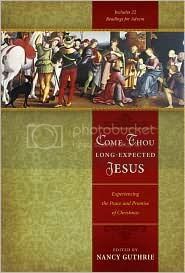 In preparation for Christmas, Megan, Joanna, and I have been looking over a few advent devotional books for the Christmas season, which prompted us to have an early Christmas giveaway. 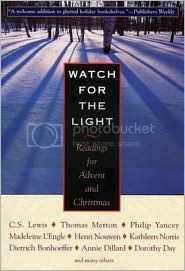 Most of the following advent books are to be read throughout the Christmas season, some even starting in late November. So while Christmas might still be 39 days away, it's certainly not too early to begin to consider the reality of what we celebrate. To enter to win, leave a comment on this post answering the following question: What type of article would like to see more of on the blog? Sister to Sister? Author profiles? Friday Footprint type recommendations? Have any ideas of your own? Let us know! And, if you'd like to be thrown in the batch a second time, subscribe to the blog (see the button at right) and let us know that you did with your comment. And if you'd like to be entered a third time for an even greater chance of winning, post about the giveaway on your blog and make sure to leave us the link to your post! Comments will be closed this Thursday at midnight and the winner will be announced on Friday. Hey, I'd like to see more Sister to Sister articles. They are extremely helpful to me! Hey, I'd really like to see more Sister to Sister articles. They're really helpful and give me a good perspective on how to live as a Godly Christian girl. Thanks for all you guys do on this blog! Hello! I'd like to see more biblical fiction lie the stories Megan wrote on Rahb and Rebekah. We are currently going through a series in church on Ruth and it's amazing how much material there is for a story! Just a thought! I'd like to see more Sister to Sister articles :) I really get a lot out of reading them! Hello! Book worm that I am, I'd love to see more author profiles! I love getting the inside scoop on a lot of the books that I love. I also would love to see more Sister to Sister, but have you guys ever thought of doing a series of articles on purity and/or(not)dating? I love your blog but I would love to be more encouraged to keep waiting for my husband. God Bless! Thank you so much for all you do! All of these books look so good! I would love to win one of them!! I also like the Sister to Sister articles! Although the Friday Footprints come in with a close second. Hi! I like any articles that are encouraging! Hi I would like to see more Sister to Sister. I am new to this blog so I havent read much, but they sound like they would be good. I have also subscribed to the blog. Thank you. I'd like to see more author profiles-(also as someone who reads a lot) really enjoyed the one you did a while back! Also, I subscribed to the blog for a second entry! Your blog is awesome! Thanks! I found your blog recently and have been blessed by it. I would love more Sister to Sister articles - I find them encouraging and challenging! Keep up the great work on the blog! God bless! I would love to see more sister to sister articles as well. Thanks for your blog and all you do! Well, I personally like the idea of the Biblical fiction, but I would have to say maybe put a spin on the Sister- to- sister and have an author write one... just a thought. I really like the Friday Footprints. It helps me find other resources for my walk with Christ. I would also like to see some more devotional type things. Like Sister to sister. For over 11 years, Bloom! has existed to spur you on in your journey towards Biblical womanhood. What started as a big dream in the hearts of three teen girls, turned into an international print magazine and then later turned into a thriving blog. Our heart has been to go beyond the fluff and dig deep into God’s Word and into how to practically apply that to our daily lives. If any good has come out of Bloom!, we know it is because God is the one who waters the seeds we plant (1 Cor. 3:7). This journey of magazine and blog has spanned for over a decade and what a thrilling and beautiful one it has been.God has deepened and widened our worldview.He has given us a deeper understanding of His ways.He’s brought me (Joanna) through some really hard times and pushed me to write despite the pain.He’s shown me that although I am nowhere near perfect, He can still use me anyway. It's almost 2017 and that means it's a great time to reflect on your Bible reading plans for the new year. We thought it would be helpful if we reposted this list from last year of reading plans offered by three different ministries. Take a look below and pray about how the Lord would have you study His Word in this new year. - OT and NT in the NIV version, 365 days. Readings sent daily to your email. - OT and NT in the KJV version, 365 days. Readings sent daily to your email. - NT in the NIV version, 365 days. Readings sent daily to your email. - 5x5x5 plan - read through the NT in a year, Monday through Friday. We're five girls - Joanna, Megan, Krista, Emily, and Victoria - and we're passionate about following Jesus and helping other girls fall more in love with Him. Back in November 2006, we started the print magazine of Bloom! and while Bloom! is no longer in print, we can still be found here on the blog. It's our deep desire and prayer to encourage, inspire, and support girls on their journey towards a gospel-centered, world-altering, Biblical womanhood! Copyright © 2006-2018 by Bloom!